To inforce a team of lawyers practitioners providing high quality in legal services to every client. RWANDAN STUDENTS OF LAW(RSL) added a News update. 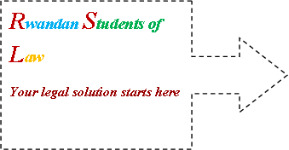 RWANDAN STUDENTS OF LAW(RSL) updated its Projects page. RWANDAN STUDENTS OF LAW(RSL) updated its IGP page. RWANDAN STUDENTS OF LAW(RSL) updated its Team page. RWANDAN STUDENTS OF LAW(RSL) updated its History page.